The full bloom dates for Pink Lady, Gala, and Honeycrisp in Winchester are 4/16, 4/18 and 4/18, respectively. 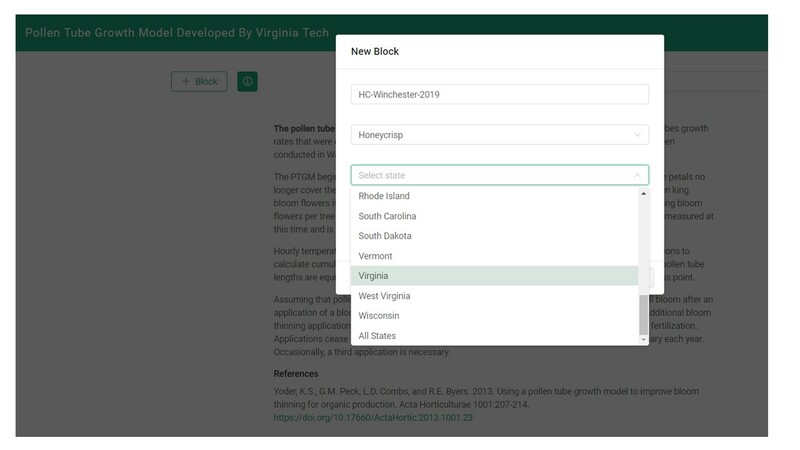 In Central Virginia, bloom dates for these varieties are 7-10 days earlier. So, it’s about the time to think about chemical fruit thinning options and prepare our arsenal. The following are tables summarizing the materials, rates, and timing for chemical fruit thinning in apples. 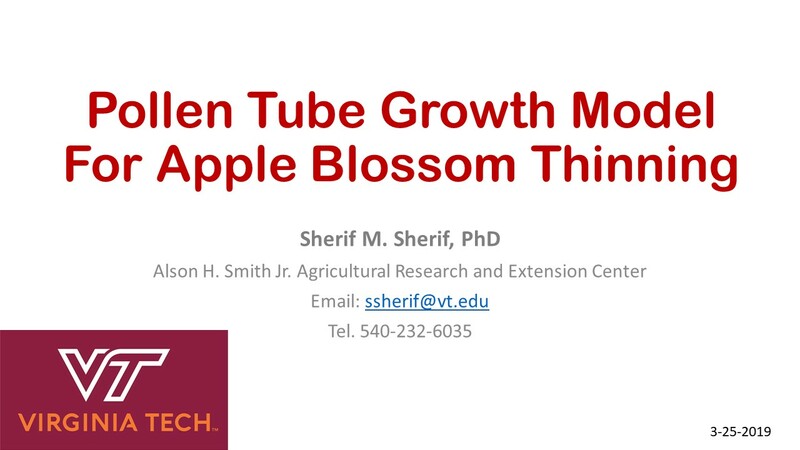 More details will be provided through our in-orchard meeting in Central Virginia and the In-Depth meeting in Winchester this week. 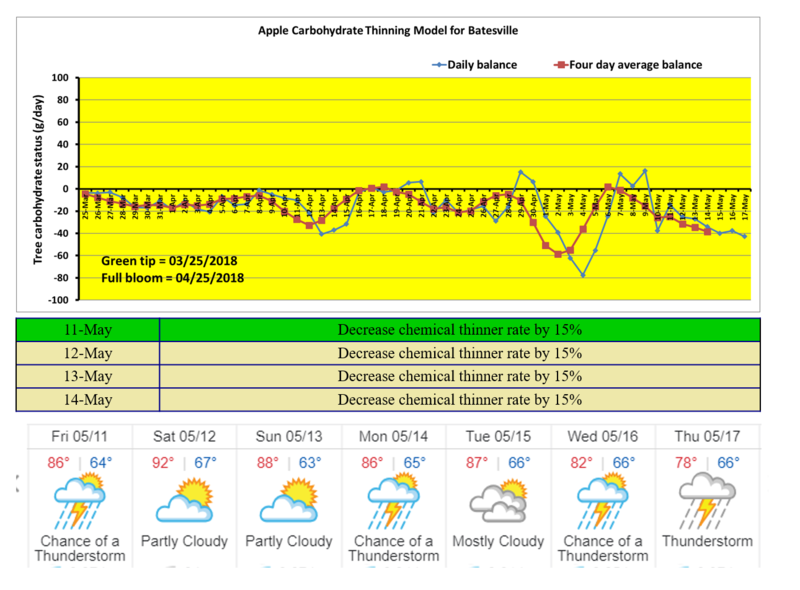 Also, I will run the carbohydrate thinning model and provide weekly updates on model outputs and thinning recommendations based on three weather stations: Batesville-for Central Virginia; Gadino Cellar-for Rappahannock/Madison area and VT-AHS AREC for Frederick County/Shenandoah Valley. Table 1: Common chemical thinners, tradenames, and manufacturers. Table 2: Effective thinning sprays at petal fall to 5 mm fruit diameter. Table 3: Effective thinning sprays at 6-15 mm fruit diameter. Table 4: Effective thinning sprays at 16 mm-25 mm fruit diameter. 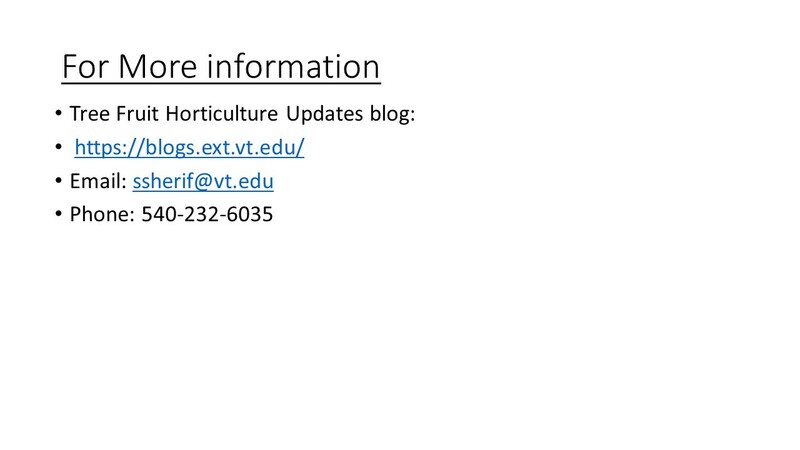 Note: Application rates are based upon a concentrate spray volume of 100 gallons per acre and product labels at the time of publication. 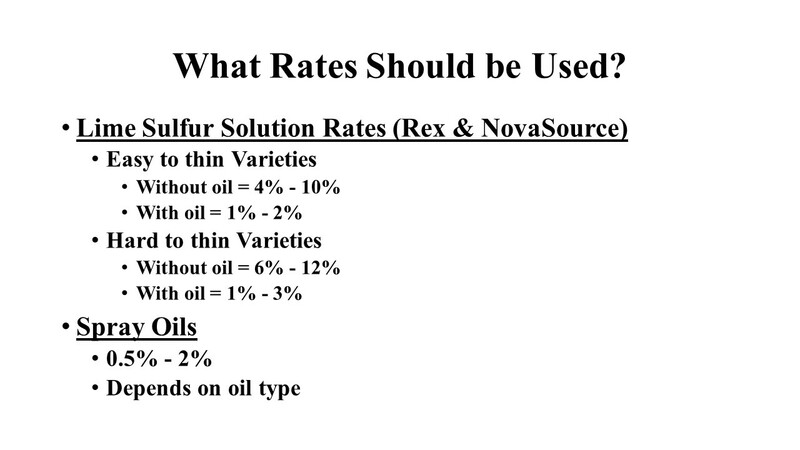 When applying chemical thinners use the rates indicated on the labels of the products that you are using. Always follow the label when applying chemical thinners. The degree of thinning actions are listed according to the author’personal field experience. The degree of thinning action may vary from orchard to orchard and block to block. 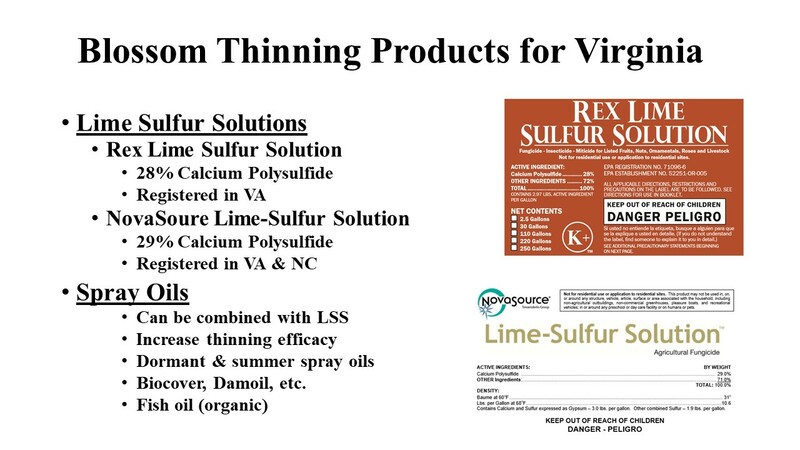 a) Using blossom thinners: Two products of lime sulfur are now labeled for blossom thinning in Virginia. These are Rex lime sulfur and NovaSource lime sulfur. Two to three applications of lime sulfur at 2% (2 gallons/100 gallon per acre) mixed with oil (e.g., JMS Stylet-oil) at 1% will be enough to prevent the fertilization and fruit set of the majority of king and side blossoms. 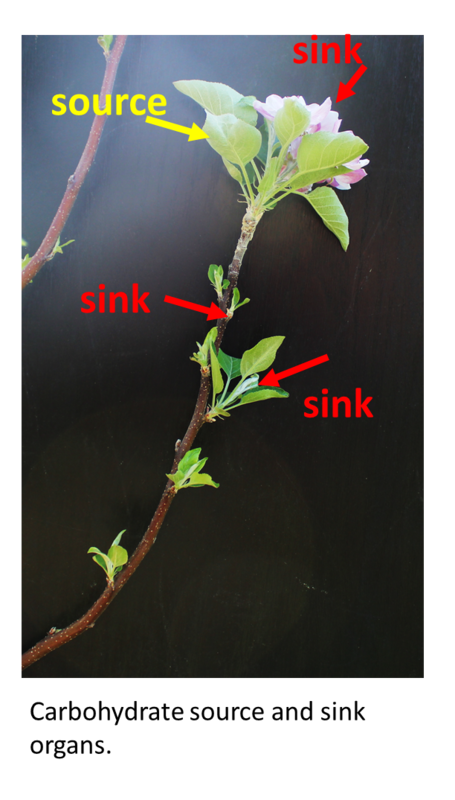 However, blossoms thinning sprays should be avoided when daytime temperatures are favorable for fire blight infections, e.g., between 75 to 85 oF, or when fire blight models (e.g., Maryblyt) predict blossom infections. 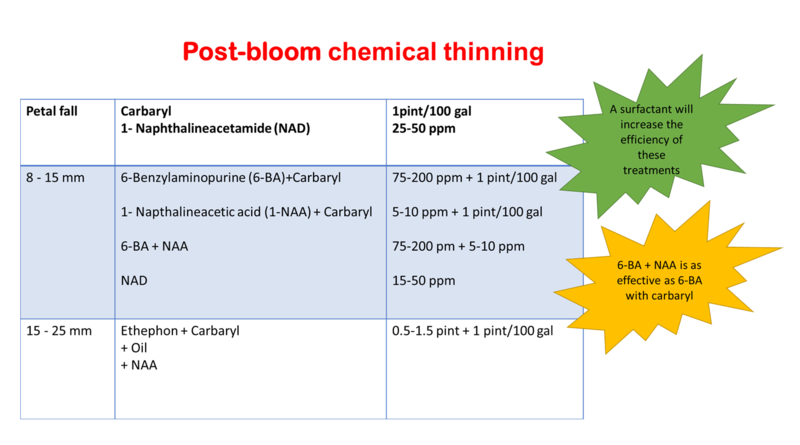 b) Using post-bloom thinners: chemical products containing 6-BA (e.g., Maxcel and Exilis 9.5SC) or NAA (e.g., Fruitone L, PoMaxa and Refine 3.5WSG) can be applied in combination with carbaryl (e.g., Sevin XL plus) to remove apple fruitlets. Two applications at fruit size 6-18 mm will be sufficient. 6-BA at 75-200 ppm or NAA at 10 ppm combined with carbaryl at 1 qt/100 gal/acre should achieve satisfactory results. However, it should be noted that NAA is not recommended for Fuji and Delicious. Defruiting with 6-BA or NAA will be more efficient if trees are under carbohydrate deficit conditions. 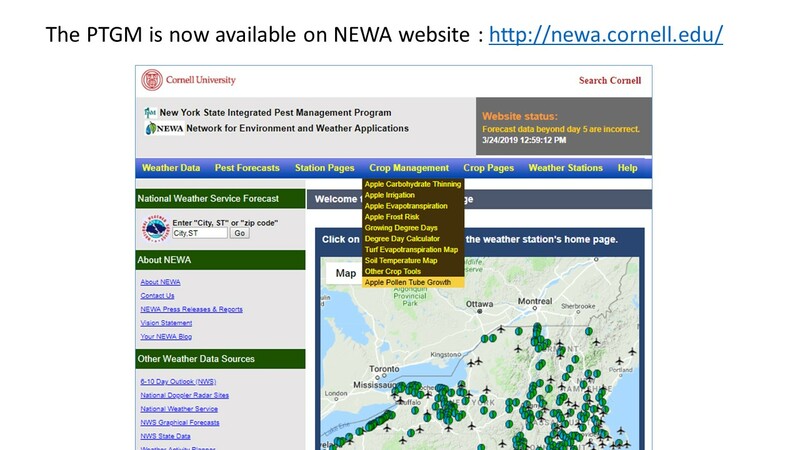 The carbohydrate thinning model on NEWA (http://newa.cornell.edu/index.php?page=apple-thin) predicts the carbohydrate status of the tree based on daytime temperatures and solar radiation values. The best defruting conditions will be obtained if the model predicts a 4-day average balance of -40 to -80 g/day. 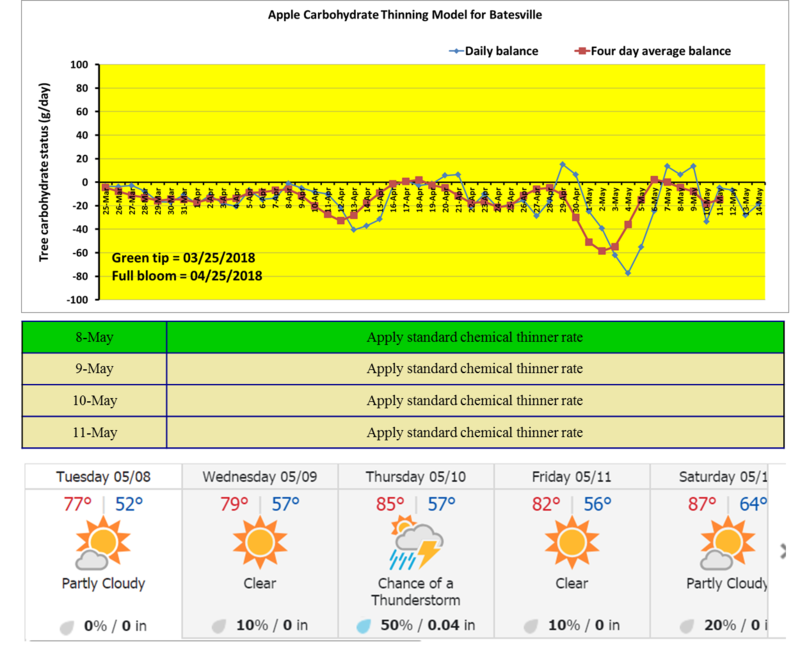 If the model is not accessible, defruting sprays by 6-BA and NAA should be applied when daytime temperatures are ≥ 85 o. Cloudy days before and/or after defruting applications should also be targeted. Adding a non-ionic surfactant (e.g., Regulaid) to the spray tank will also enhance the efficacy of defruting applications. The following figure shows the effect of two defruting treatments on fruit set (%) and crop load (fruit/branch cross-sectional area) of Honeycrisp and GoldRush trees, respectively. Treatments were applied twice at fruit size 6-18 mm. c) Ethephon and carbaryl application: This combination will remove most fruit, but may cause tree growth reduction and increase flowering the following year. Use 1.0 to 1.5 pt of ethephon tank mixed with 1 qt of carbaryl and a surfactant or 1 qt of Superior oil/100 gal/acre. Apply when fruit are between 10 and 15 mm in diameter. Select a day when daytime high temperatures are expected to be between 70 and 90°F. Shoot growth reduction by prohexadione-calcium (PC) (Kudos and Apogee) early in the season (at Pink) significantly reduces bitter pit incidence by 45-54%. PC applications at pink also reduce the incidence of blossom blight and subse­quent shoot blight. Use at the rate of 6 oz/acre. PC is not active at high pH levels: Use magnesium sulfate or water conditioner to lower the pH level. PC should not be mixed with calcium or boron. Adding a surfactant to the tank increases the efficiency of PC applications. Use anti-foam agent if the surfactant is one that foams. If the water source contains high levels of calcium carbonate (hard water), add ammonium sulfate (AMS). Both Kudos and Apogee are labeled for use at pink in apples. 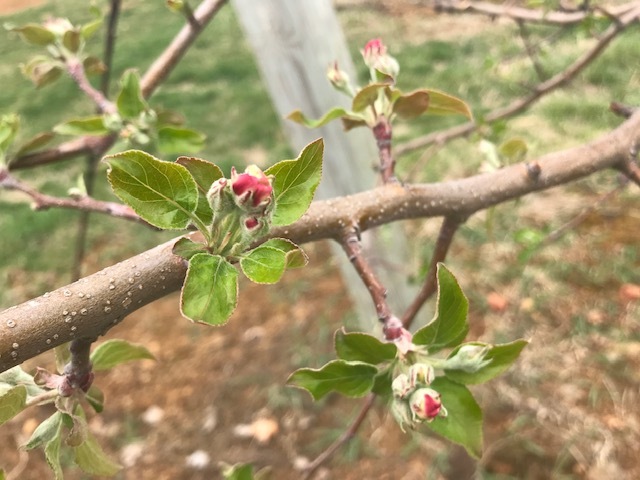 Pink Lady (top) and Gala (bottom) flower buds on April 8, 2019. Between 15-50 pound of calcium chloride should be added per acre per year to reduce bitter pit incidence. In other words, 2-8 pound/cover spray. Early season applications of calcium are more important than late-season applications. Foliar applications of Ca nitrate are not recommended for Delicious and York. They might cause cork-spot like symptoms. Soil applications of Ca are not efficient. Ca nitrate contains 13.5% nitrogen and it might affect fruit coloration if nitrogen levels in the orchard are already high. Calcium content in fruit is largely affected by crop load, vigor control, and nutrient management. Fruits in the higher part of the canopy contain more Ca than those in the lower half of the tree. Boron deficiency may reduce Ca movement in the tree. – Boron is essential for Ca movement and Boron deficiency may lead to Ca-deficiency disorders including bitter pit. It is recommended not to mix Solubor and calcium chloride. The annual amount of nitrogen for mature apple trees in high-density planting is about 50-80 lb/acre. If the soil has 3% organic matter, this alone can contribute 30-40 lb/acre of nitrogen. Foliar application of urea early in the season at 3 lb/acre (prior to bloom) or 5-6 lb/acre (at petal fall) is beneficial for fruit set, early fruit growth, and leaf development. Although this is the time of the year we usually talk about rescue thinning treatments, this might not be necessary this year. 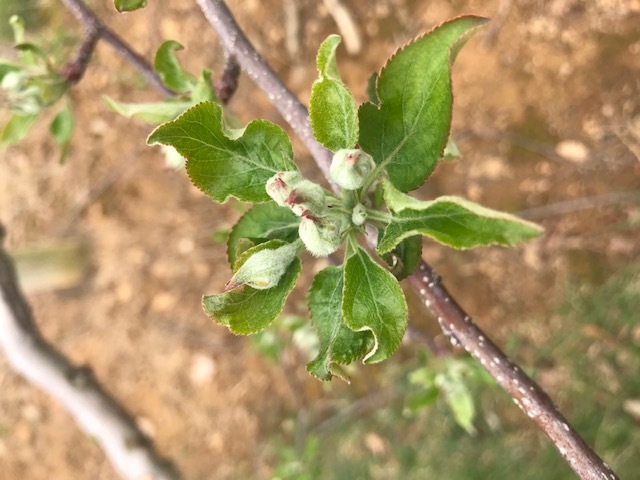 The several days of cloudy and rainy weather last week (April 13-18) had resulted in natural fruit abscission in many varieties. Although the carbohydrate thinning model did not predict any natural abscission to occur, it showed a severe carbohydrate deficit in the last ten days. Today I was examining some apple blocks in our research farm, and I noticed a lot of apple fruitlets under the un-thinned trees. 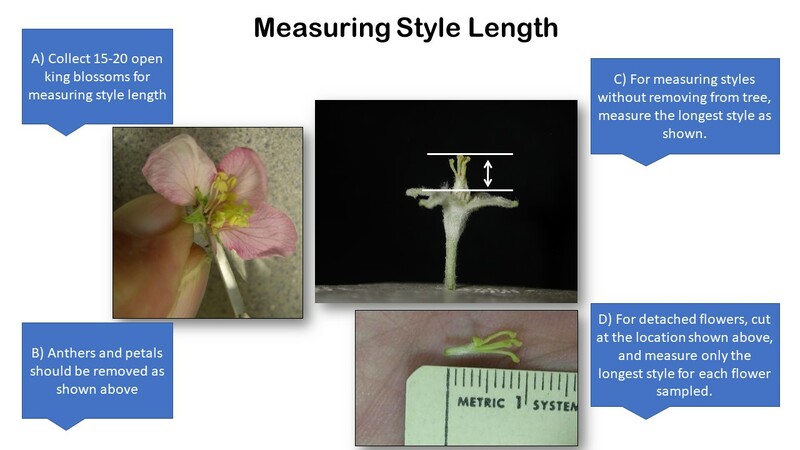 The size of abscised fruit ranged between 11.1 mm in Gala to 13.6 mm in York (see the figure below). 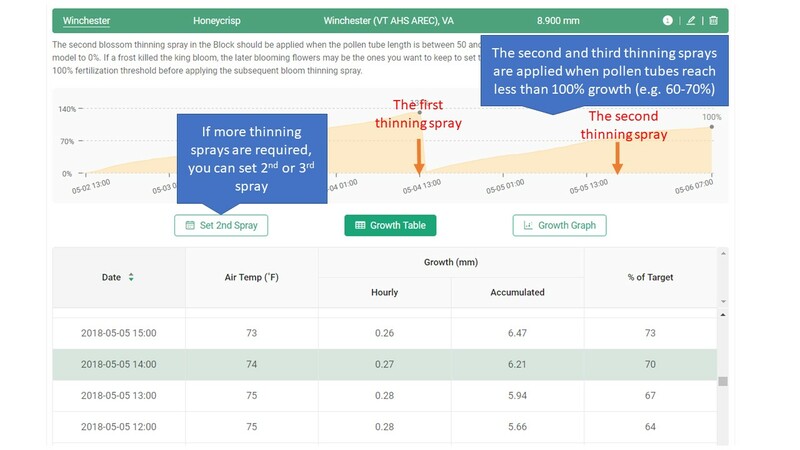 Although this predicts over-thinning in blocks sprayed with chemical thinners early last week, it could be just fine with some varieties like Fuji where chemical thinning is not always effective. 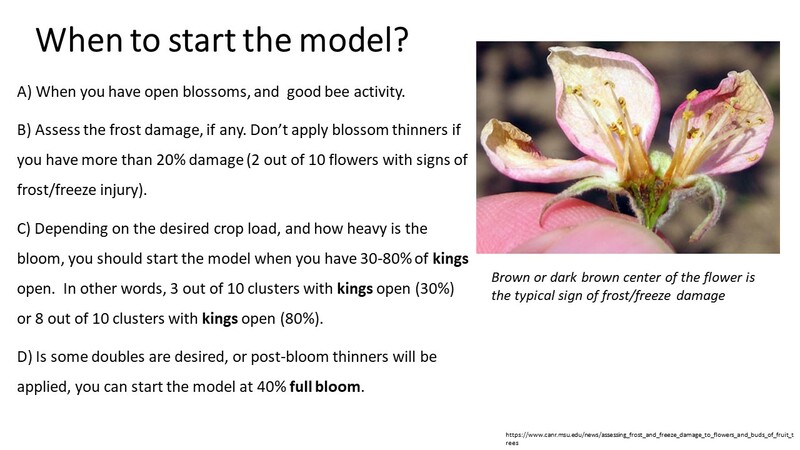 If natural fruit abscission or over-thinning is the case in your blocks, it might be wise to reduce the number/amount of return bloom applications as this might result in excessive blooming next season. According to the carbohydrate thinning model outputs for Winchester, we had only 1 day of carbohydrate surplus since the beginning of the growing season, with a value below 10 g carbon/day. This is mainly due to the several hot/cloudy/ and or rainy days and warm nights we had in the last two weeks. 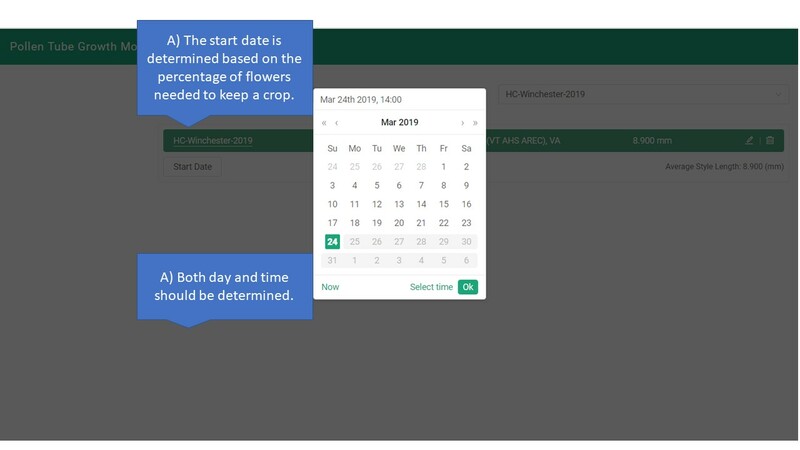 For those who started thinning applications last week (May 10-12), it might be wise to wait to see the effect of these treatments before starting extra thinning applications next week. For those who did not start thinning yet, Sunday (May 20) will probably be a good chance to apply your first thinning application. 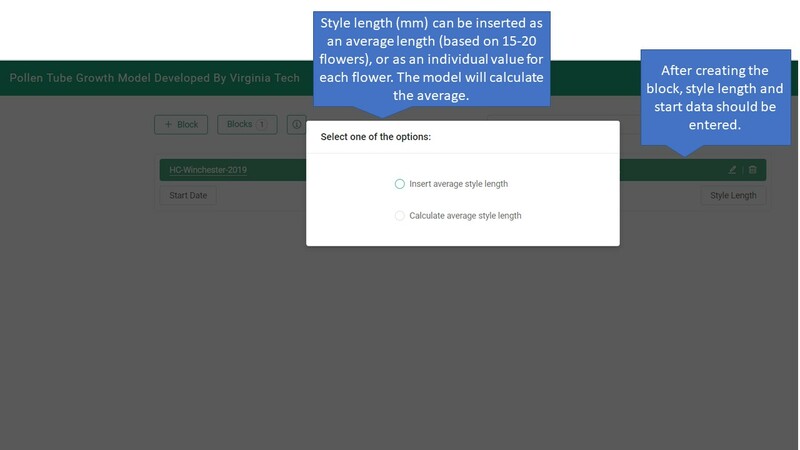 Fruit size will be < 15 mm for most apple cultivars and temperature will be good for 6-BA and NAA applications. As for today, we have Pink Lady at 16.5 mm, Fuji (12.35), Gala (15.6) and Honeycrisp (13.3). The model recommends applying the standard rate of chemical thinners and so do I. For Central Virginia, the model outputs are almost similar to those of Winchester, with a more carbohydrate deficit is expected in the next three days. The model recommends reducing the rat of chemical thinners by 15-30%. Fruit size is > 15 mm now and 6-BA or NAA won’t be effective as thinners. Ethephon should be used instead if more thinning is needed. use ethephon (0.5 to 1.5 pints) + carbaryl (1 pint/ 100 gallon). For alkaline water, buffering the spray solution to a pH of 3 to 5 will increase chemical stability and effectiveness. With a temperature ≥ 85 oF, ethephon might result in overthinking. 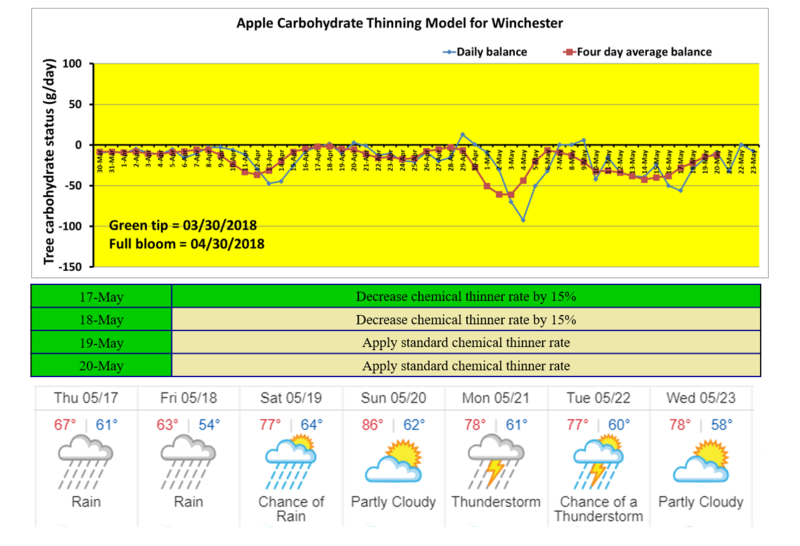 I ran the carbohydrate-thinning model today for Winchester and Central Virginia, and it seems like we are in the right time for fruit thinning, in terms of fruit size, weather conditions, and the tree carbohydrate status. 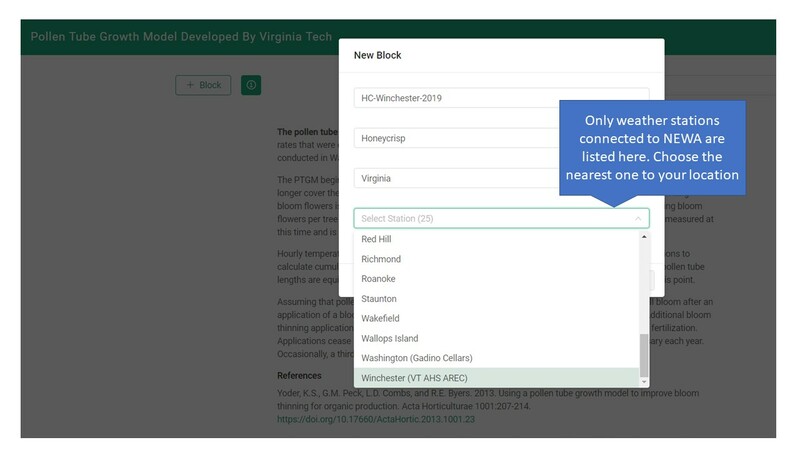 The average fruit size is between 8 – 15 mm, and the temperature will be 88 oF and 92 oF tomorrow (May 12) in Winchester and Central Virginia, respectively. The carbohydrate model predicts carbohydrate deficit until May 17 in both areas. The model recommends reducing the rate of chemical thinners by 15 – 30%. I would not encourage you to follow this rule, especially with the hard-to-thin apple varieties, like Fuji, Gala, Rome, York and Honeycrisp (see the table below). I would even use the higher dose of chemical thinners at this stage, and make it one strong thinning application, instead of two mild applications. Trees will respond well to 6-BA and NAA at this stage, and the likelihood of overthinning is low. It is not recommended to use NAA with Fuji and Red Delicious; as this may result in pigmy, seedless fruits. Instead, you can try a higher concentration of 6-BA (at 200 ppm), with carbaryl (1 pint) and a non-ionic surfactant (e.g. Regulaid). 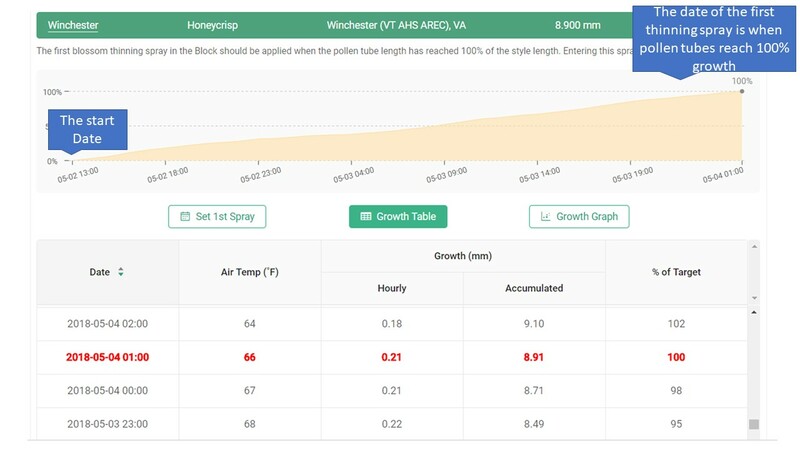 6-BA is more effective when temperatures are above 85 oF and it increases the rate of cell division and final fruit size. NAA should give better results with Honeycrisp and York. You can use up to 10 ppm of NAA and mix it with carbaryl (1 pint/ a 100 gal) and a surfactant. If you do not know what chemical to use with your cultivar, use 6-BA. 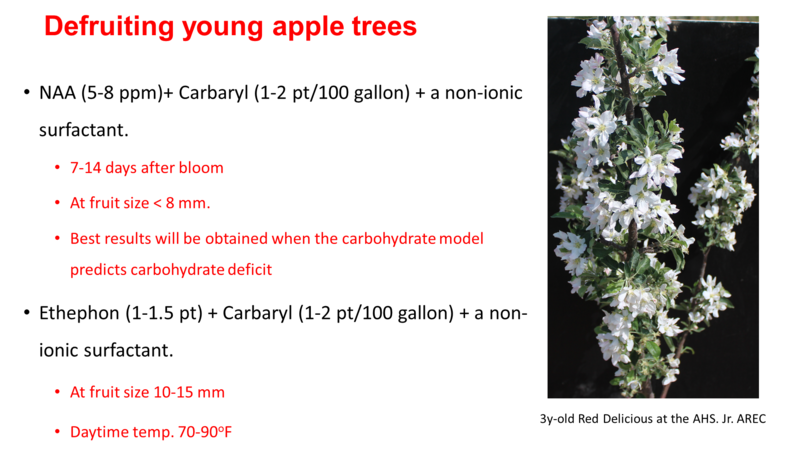 For de-fruiting young apple trees, use the maximum rates of chemical thinners (i.e. NAA at 10 ppm, carbaryl at 2 pint/100 gallon, and a Regulaid at 1/2 pint/100 gal). 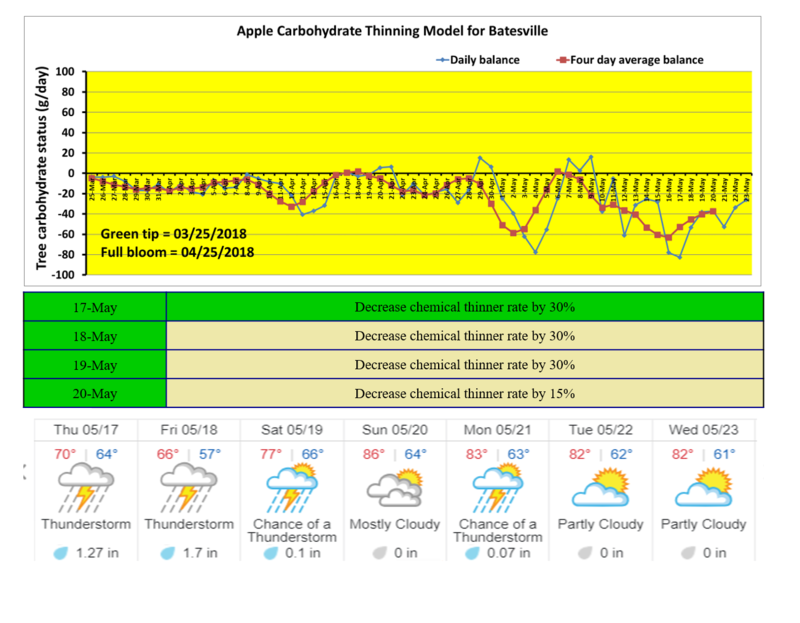 Below is the carbohydrate thinning model outputs for Central Virginia. We used the weather station of Crown Orchard at Betesville, for temp. and solar radiation values. 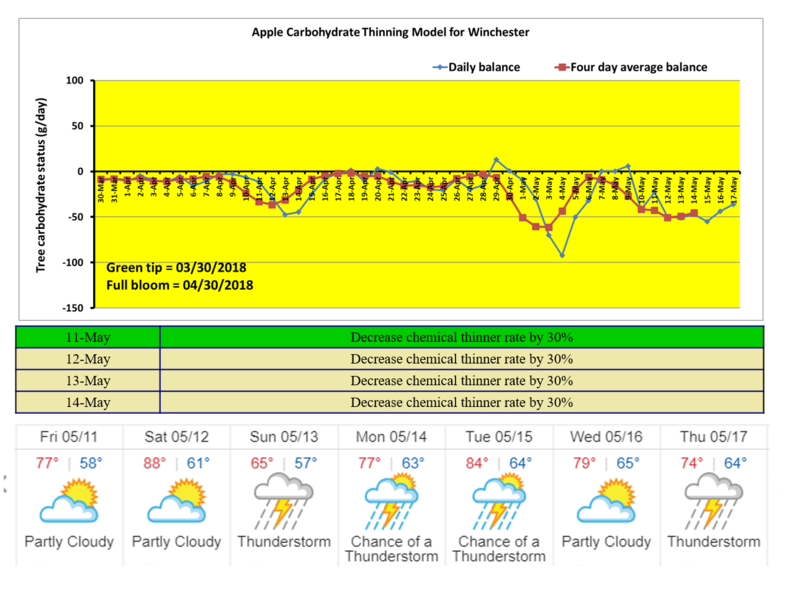 The model predicts carbohydrate deficit until May 14th, which is good for chemical thinning. 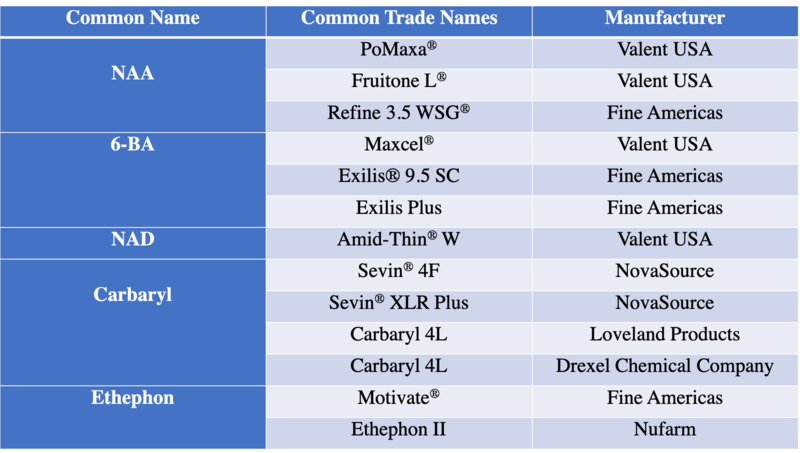 You may consider using the maximum rates of 6-BA (200 ppm), and NAA (10 ppm) and adding a non-ionic surfactant to your tank (see the table below) to enhance thinning efficiency. We will start the model for Winchester/Frederick County when we reach a fruit size of 8 mm in Gala. 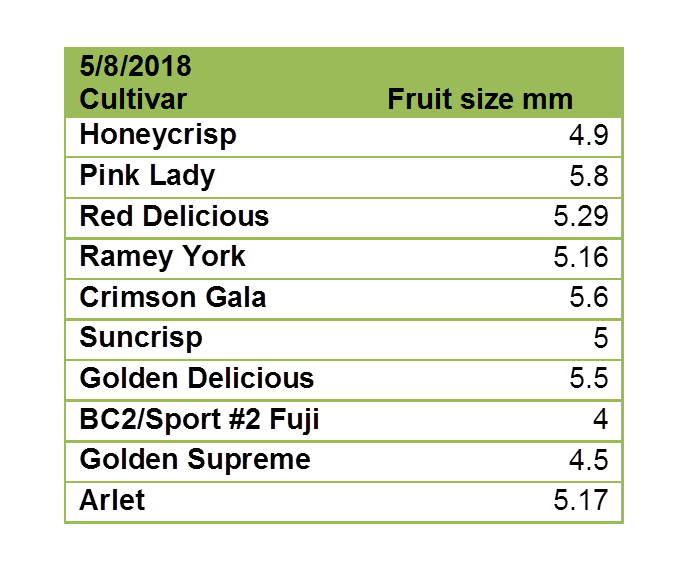 As of today, the fruit size of our apple cultivars in the AREC’s research farm ranges between 4-5.8 mm (see the table below). 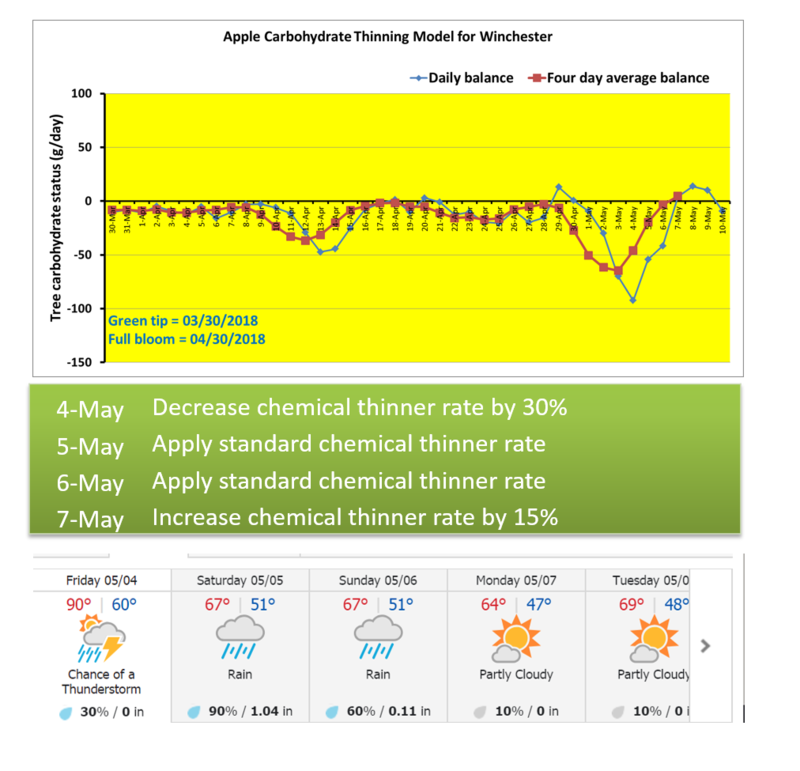 Below are the outputs of the carbohydrate thinning model for Winchester area. 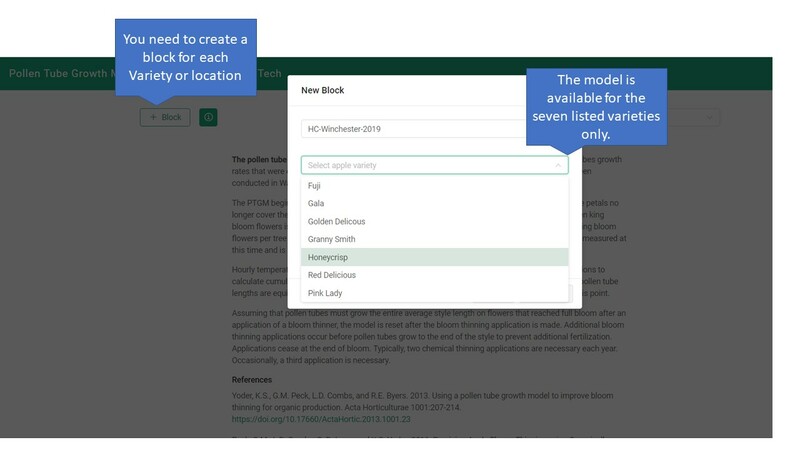 I used Gala’s green tip and full-bloom dates to run the model, but this should be working for the majority of apple cultivars. 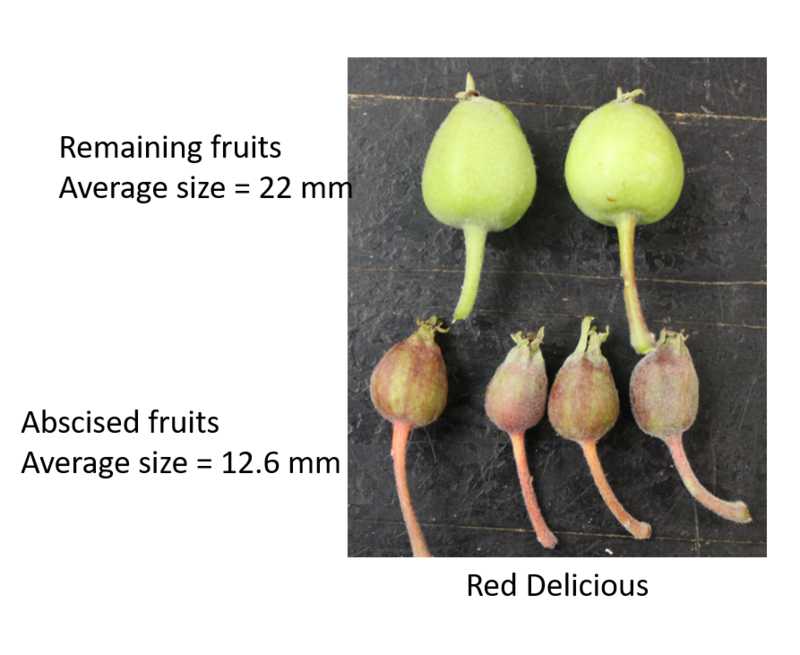 The fruit size of most cultivars we have in our research farm ranges between 3-5 mm. We usually recommend a fruit size of 8-15 mm, to start post-bloom thinning applications. So, the purpose of today’s post is to remind you of the basics of this model and how to read and interpret the outputs. Basically, we use temperature and solar radiation data from the nearest weather station to our orchard in order to calculate how much carbohydrate a mature apple tree would make a day (g/ day) starting from the green tip date; and how much carbohydrate a tree would demand. If the balance between the carbohydrate supply to demand is negative, the sensitivity to chemical thinners will be high, but if this balance is positive, the response to chemical thinners will be low. Cloudy days, warm nights and high temperatures for a number of days negatively affect carbohydrate production and result in carbohydrate deficit; whereas sunny and cool days promote photosynthesis, leading to carbohydrate surplus. In the chart below, the blue line shows the daily carbon balance, whereas the red line shows the average of four days (the present day and three days in advance). We consider the four-day average (the red line) when deciding for thinning time and rate. Beside the temperature and solar radiation, the percentage of the source to sink organs also determines the tree carbohydrate balance, and subsequently the response to chemical thinners. Therefore, in the chart above, you will notice a carbohydrate deficit in the last five days despite the sunny weather. This is mainly due to two reasons: a) temperatures were high (> 88 oF) which encourages photorespiration, not photosynthesis; b) the demand of sink organs (i.e. flowers, young fruit, young leaves, buds) to carbohydrate is higher than what source organs (i.e. mature leaves) can provide at this stage (see the figure below). This balance between sink to source organs will change as leaves mature, and the competition among sink organs decreases.